The sea scallop is the largest of the scallops. This Scallop Pasta Recipe calls for sea scallops but you can use the smaller bay scallops if you wish. With the large sea scallop you usually get about 20-40 in one pound. They are best bought fresh, not frozen. 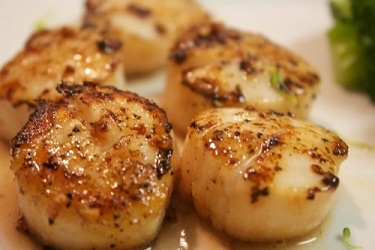 And, scallops have a distinct, sweet odor when they are fresh. They are sometimes cut into halves or quarters for cooking but you must take care not to over cook them. As soon as they lose their translucence and turn opaque, they are done. If you over cook scallops, they become tough. Sea scallops are cooked in almost every way that fish is cooked. The most popular methods are sautéing, deep frying, broiling and poaching. Bay scallops are about 1/2 inch in diameter, so you usually get about 50-90 per pound. Be especially careful when cooking bay scallops. Because they are small, they tend to cook very quickly and over cooking them is easy to do. Because of their small size, bay scallops are best if they are baked or sautéed. 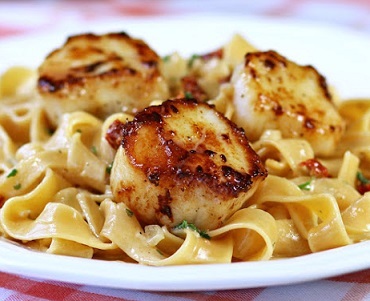 This Sea Scallop Recipe calls for linguine pasta, but you can substitute fettuccine or other long, narrow pastas. TA-DA! 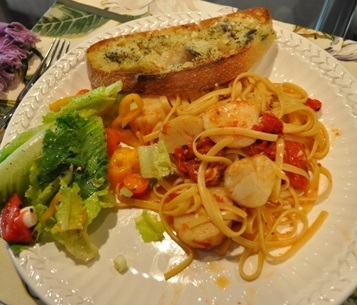 You have a delicious Scallop Pasta meal! Serve it with garlic bread and a salad! 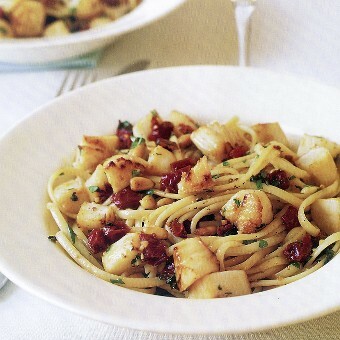 Enjoy your delicious, favorite scallop pasta recipe and the company of those you share it with! Did you know? In the early 1990s, the fishery for Atlantic sea scallops in the northeastern U.S. was not sustainable – the population was near record lows and fishing was at a record high. Today, the Atlantic sea scallop population is near record highs and the fishery operates at sustainable levels. Currently, this fishery is not only one of the most valuable fisheries in the United States, but it is also the most valuable wild scallop fishery in the world.